Imagine earning $4 million in 12 days selling chocolate chip cookies. 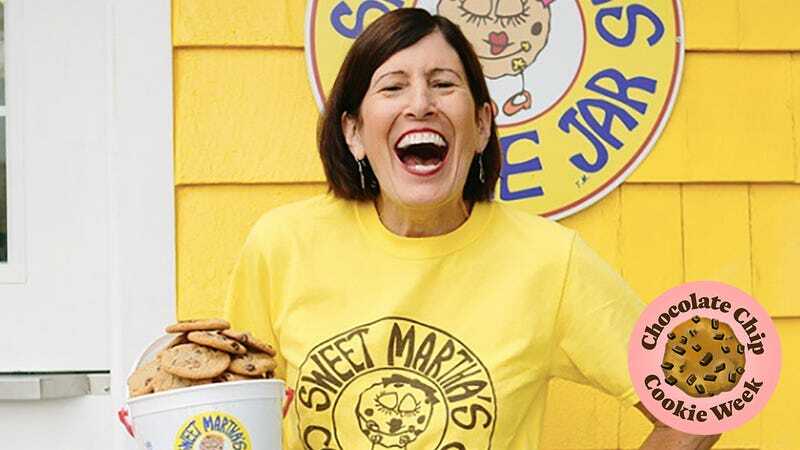 That’s the life of St. Paul, Minnesota native Martha Rossini Olson, better known to Minnesota State Fair attendees as Sweet Martha of the extremely successful Sweet Martha’s Cookie Jar. Along with her partners—husband Gary Olson, life-long friend Neil O’Leary, and his wife Brenda—Olson has been serving up oven-hot, baked-on-the-spot chocolate chip cookies to hungry fairgoers every summer for nearly 40 years. And for many of those years, I was one of them. For a kid growing up near the border of Superior, Wisconsin and Duluth, Minnesota, the Minnesota State Fair was a summer destination. I would spend the three-hour car ride there dreaming about stuffing my face full of everything from deep-fried cheese curds to fry-bread tacos. But I was always especially excited about the chocolate chip cookies. Sweet Martha’s Cookie Jar cookies are worth the long line wait. They epitomize the phrase “just like mom used to make,” and are a real no-fuss kind of cookie that can be enjoyed plain or dunked in milk. Served hot, they are sweet, soft, and thin, and each bite is met with the sort of gooey chocolate only a fresh from the oven cookie can deliver. And there a lot of bites. Sold by the pail, an order of Sweet Martha’s gets you approximately four dozen cookies to enjoy. There are no restrictions, no watching your weight, no worrying about cavities, and that’s a delicious sort of freedom. The Takeout chatted with Olson to talk about her interesting cookie career and its history. The Takeout: After nearly 40 years at the Minnesota State Fair, what’s changed and what hasn’t? Martha Rossini Olson: The Fair has always been a draw for numerous reasons, but now more than ever, there seems to be a major emphasis on food. Every year, Minnesotans look forward to learning what the new foods are. Eating habits and preferences also seem to have evolved over the years. Back when we started in 1979 at the Fair, a larger percentage of the food stands were full-service, sit down eateries. Now, when you go to the fair, many of the dining halls are gone and a lot of the food now is quick serve or window service. TO: Even with all this food evolution, you’re leading the pack with a tried-and-true classic. What do chocolate chip cookies mean to you? MRO: They’re the all-American treat and remind me of growing up and having them fresh out of my mom’s oven. In fact, everything she made was homemade. She baked almost every day. TO: When you first started, you were working out of a small booth. Now you have three permanent buildings and are selling about 1 million cookies each day. Is there a moment when you realized how successful Sweet Martha’s Cookie Jar would become? MRO: The growth grew on us. We had no idea that our business would take off when we first started. And we’re still in awe of how far we’ve come from the 9-by-11-foot booth we started with. TO: Speaking of size, the Minnesota State Fair is the largest state fair in the United States by average daily attendance. What challenges does that present? MRO: The most challenging part is trying to keep up with our growth. Whether it’s within the confines of our buildings or recruiting new employees, there’s always a new challenge to tackle. TO: On the flip side, what’s the most rewarding part of the business? MRO: The staff and the customers! We have employees that come back year after year, and it’s like a reunion every year at the fair. And I love seeing the smiles on our customers’ faces when they’re handed an overflowing cone or pail of cookies. It’s the best! TO: Ah, yes, it’s important to note that the cookies come in two sizes, a cone or a gallon pail, both overflowing. Whose idea was that and what was the thought process behind it? MRO: Our wonderful crew helped come up with the ideas for the cone and the pail. The cone came first and the thought process behind it was to make it portable and to use it as a vehicle for marketing since the cookies are visible. As customers began asking for larger portions, the pail came along several years later. We adopted the same concept behind the cone and decided to overflow the pail with cookies. TO: What do you the other 353 days of the year when you’re not at the fair? A lot of work must go into preparing for those 12 days. MRO: That’s exactly right, there is definitely a lot of work. In fact, it has become pretty much a year-round operation. Post fair, there are weeks of clean up. Then we work on taking inventory so we can place orders for supplies for the following year. We also recently launched our frozen cookie dough nationwide, which is now available in most Target stores. Then in February, we start working on staffing. In March, we start conducting meetings with our managers. We also sell cookies at various events on the fairgrounds throughout the summer, which leads us back to the Minnesota State Fair. TO: How does it feel to know how important your cookies are to the customers? A lot of people spend those days, almost all year, looking forward to these cookies! MRO: We’re very humbled, but also very thrilled.